Competitive advantage is an essential ingredient of strategy. Competitive advantage in business is the advantage you have over your competitors that’s to say why and for what reasons customers prefer to choose you instead of the array of others producing the same services or goods. You create it from your strengths and innovative thinking: What makes you better or how you can become better than your competitors. 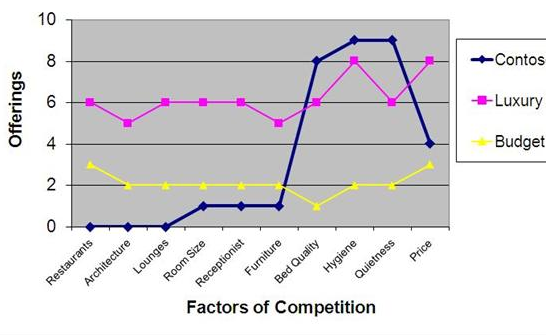 One good way to bring it down to specifics is the strategy canvas by which the various competitive factors, existing and other new ones that you might think as appealing to your segment of customers are rated and presented in a graph comparing you and your competitors who are after the same segment of clients. The picture on the top serves as an excellent illustration. To possess a competitive advantage is not enough. You must devise ways to deploy your competitive edge in the particular game you are playing.